World Circus Day is an annual holiday dedicated to circus as an art form. It has been celebrated on the third Saturday of April every year since 2010. The holiday was initiated by the European Circus Association and the World Circus Federation. The World Circus Federation (Fédération Mondiale du Cirque) was founded in 2008. The organization is headquartered in Monte Carlo, Monaco. Princess Stéphanie of Monaco serves as the honorary president of the Federation. The World Circus Federation is a non-profit organization that aims to preserve, support and promote the art and culture of circus. On April 19, 2008 the World Circus Federation celebrated European Circus Day for the first time. The holiday became international in 2010 and has been celebrated every year since. According to the Federation, World Circus Day is the world’s largest common international feast of the circus communities. Its main goal is to celebrate circus arts and culture as well as to get more people interested in circus. 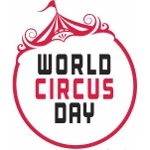 The World Circus Federation encourages circuses around the world as well as circus schools and other organizations somehow related to circus to organize special events dedicated to world’s circus days. Any participant can register their event online so that more people can learn about it.